Chef Ebinger has done it again. 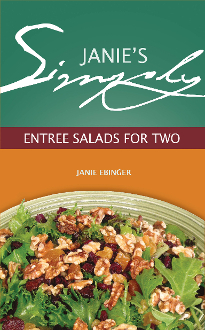 Your adventure through her new book, Janie’s Simply Entrée Salads for Two takes you places that are so delicious and simple, you will not want to stop your journey. With each turn of the page you will find another adventurous recipe more exciting and enjoyable than the one before. With easy directions and common ingredients, even a novice can have a 5-star salad! If you found it hard to put down her Simply Vinaigrettes from Ancho Chili to White Wine recipe book, you will find it even harder to put down her instructions for tantalizing salads. So, sit back, relax, find a recipe you want to make (there are seventy of them! ), and let your journey continue.